Pictured at the official ribbon-cutting Nov. 22, 2018, back row from left: Brenda Carroll (Tudor Manor Administrator); Julie Errmann (VIK Academy Founder and CEO); Ada Parsons (Tudor Manor Resident); Laurie Chandler (V.I.K. Society Board Chair); Norma Jackson (BSF Board Chair); Mike Conroy (BSF President and CEO); Mayor Bill Robertson (Town of Okotoks); Kimberlee Massing (Children’s Services Family and Community Resiliency Branch). Front row: VIK Academy students. 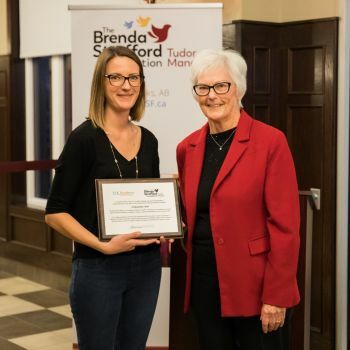 On November 22, 2018, The Brenda Strafford Foundation was pleased to officially celebrate the grand opening of V.I.K Academy Okotoks preschool and kindergarten at Tudor Manor. The Brenda Strafford Foundation is proud to be home to V.I.K. Academy Okotoks, the first Early Learning and Child Care (ELCC) Centre in the Town of Okotoks. This Alberta-wide pilot program provides quality child care with maximum fees of $25 per day. ELCC Centres support children and families by focusing on improvements to enhance the current system. "It's just wonderful to have them around. It cheers us all up." The French immersion child-care program that brings together children and seniors has 64 spaces, filled with 80 children between 19 months and six years old, some of them part time. It's full and there's already a waiting list. "There is a tremendous opportunity for intergenerational programming and engagement that really enriches the lives of both the seniors and the kids." Located within Tudor Manor, a Supportive Living seniors’ residence owned and operated by The Brenda Strafford Foundation, V.I.K. Academy Okotoks provides a unique experience for children and families offering quality intergenerational programming and engagement with the senior residents. This partnership aligns V.I.K. Academy’s mission to create a nurturing and stimulating environment with The Brenda Strafford Foundation’s mission to optimize well-being and enrich people’s lives.